The Garske Colony near Devils Lake, North Dakota was settled beginning in 1883. Many of the homesteads, but not all, were owned by Jewish families. Each family occupied its own land, usually a quarter section of 160 acres. Most houses were a mile or more from the nearest neighbor. The Calof and Greenberg extended families each had four homesteads that intersected at a corner, the four houses, barns, and granaries giving the appearance of a little village. The area schoolhouse was nearby. According to one description, the earliest Jewish settlers of the Garske Colony were two brothers-in-law, Morris Kohn and Herman Kaufmann, who emigrated from a wine district in Hungary after a plague wiped out their vineyards. Their story appears in The House That Shadows Built, a biography of Hollywood film magnate Adolph Zukor by Will Irwin (Zukor married one of the Kaufmann daughters). After arriving in America, Kohn and Kaufmann set off in 1881 with a capital of $380, a rickety wagon, and three horses which they put on a railroad box car for $60 heading to Devils Lake. There they mounted their horses and followed a guide several miles north across the trackless prairie. As they were building their timber and tarpaper shack, one of the horses ran away. A spilled can of kerosene caught fire, consumed the newly completed shanty and set the prairie ablaze. A fortunate rain halted this fire, but not before their new house was completely destroyed. The men returned to Devils Lake for supplies and this time they built a sod hut. They filed their claim, went into debt for money for a cow and farm machinery and planted forty acres of potatoes. Their venture was not successful. Morris Kohn soon gave up and moved to Chicago. Herman Kaufmann stayed six years before also moving to Chicago. About the time these early settlers were leaving, Bennie and Phillip Greenberg and their families arrived to file claims. 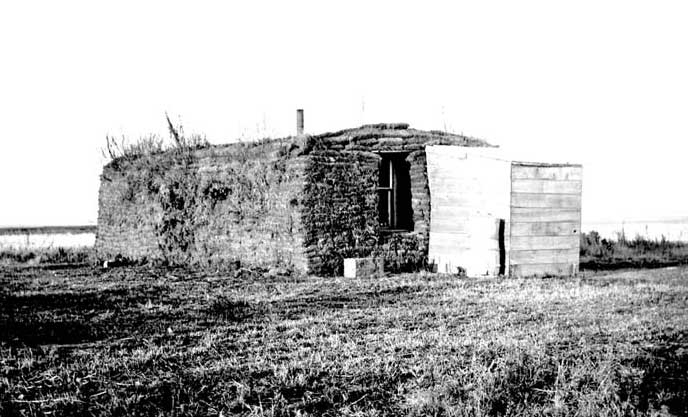 According to Early Jewish Agricultural Colonies in North Dakota by Clarence Anderson, the settlers lived through bitter winters, buried in blizzards, crowded into board shacks or mud huts with dirt floors. Dried cow manure served as fuel for heating and cooking. Bennie Greenberg eventually became the postmaster at Benzion. He remained in Devils Lake as a Justice of the Peace. According to The Hole in the Heartland by Barrie Greenbie, Bennie Greenberg was one of the first to arrive and one of the last to leave. Phillip Greenberg also moved to Devils Lake and became a businessman there, later moving to Minneapolis. 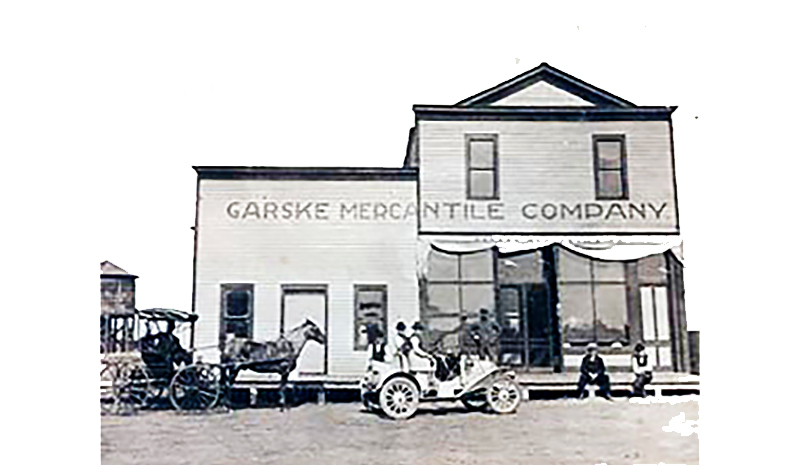 Mike Connor tells us, “….had this picture of Garske in my office, don’t know for sure when it was taken, but would assume sometime in the early 1900’s….the store was run by a ‘Hocking’ Aarsby, my Dad talked about he & his 3 brothers earning 50 cents (not each) for unloading a car of lignite coal on the rail siding (over by the RR water tower)….by the 20’s Dad said Garske had a lumber yard, bank, school, several grain elevator companies & of course the store. ….it would have been about an 8 mile walk or ride from near the Sons of Jacob cemetery to Garske, a long trip in those days. The Garske Colony was not the first community to have Jewish settlers, but it was one that succeeded. Eventually 90 Jewish men and women filed claims in Ramsey County for land in this area. German philanthropist Baron de Hirsch played an important part in the establishment of this settlement. He believed that Jews would be better accepted in the United States if they were more like their neighbors and that translated into farming. Thus many settlers received funds before making their way to North Dakota. The Minneapolis Jewish community and other communities in the United States sent food and money to help the settlers over the difficult times. Typically, the homesteaders would stay on the land the required number of years in order to receive their land patent. If their attempts at farming were unsuccessful, as most were, many homesteaders sold the land and used the money to move to larger cities such as Winnipeg, Minneapolis, St. Paul or Chicago. Some moved into the closest town, Devils Lake, to become peddlers, storekeepers or railroad construction workers. Devils Lake had a full Jewish communal life. Jewish High Holiday services were held in the courthouse and court dates were not set in the fall of the year until holiday dates were scheduled. Most settlers adhered to Orthodox traditions. Rabbi Papermaster of Grand Forks served the community as needed and came every fall with provisions and to help prepare kosher meat for the oncoming winter. By 1912, the Garske Colony was the Northwest’s oldest Jewish farming settlement. By the mid-1920s, however, the families had moved away and only the cemetery remained.